We LOVE these for summer barbecues! Healthier Slow Cooker Baked Beans that pack a big punch of flavor with maple syrup and balsamic vinegar — great cold or warm! Gluten free. So, this is actually my first time experimenting with making my own “baked” beans. Is that crazy? Growing up, we’d have canned beans occasionally, with a cold summer meal or sandwich, and I actually always enjoyed them. I think there are a lot of kids who don’t (or think they don’t), but I was never one of them. Now as an adult, I don’t buy canned pork and beans or baked beans because I avoid buying to many pre-packaged foods. I guess it had never occurred to me before now to make my own! One of the things I love about these Slow Cooker Baked Beans is that they are perfect cold, warm or room temperature. So you can make a big batch (and this makes quite a large batch!) and just keep them in the fridge to serve with all of your grilled meats for the week. Now that the weather is warmer and we’re spending more time outside, I don’t like to have to think long and hard about dinner. I like to keep things simple! Normally I like to make a big batch of potato salad (like this BBQ Bacon Potato Salad or this Warm Maple Bacon Potato Salad) and keep it in the fridge for a week or so to add to meals, and we are definitely going to add these beans to our list too! I was originally going to use apple cider vinegar, but when I was reaching in my pantry for the vinegar I caught sight of the balsamic and I love balsamic in all kinds of things (like this Honey Balsamic Pulled Pork), so I thought it would be kind of amazing. It is. But if you don’t like it, feel free to swap it out for your favorite! We LOVE these for summer barbecues! 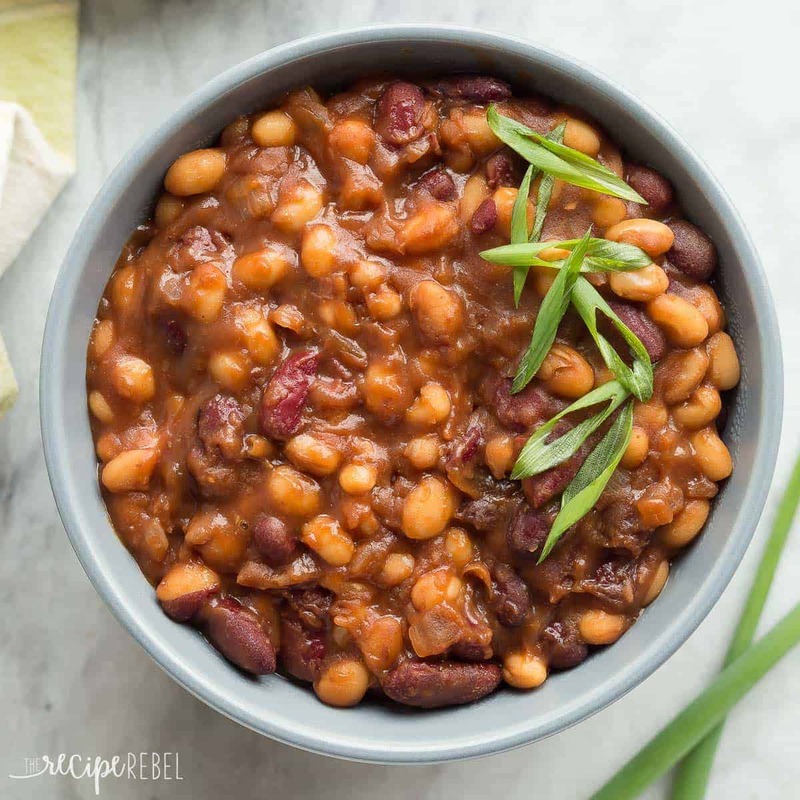 Healthier Slow Cooker Baked Beans that pack a big punch of flavor with maple syrup and balsamic vinegar -- great cold or warm! Gluten free. 1/2 cup maple syrup not pancake syrup! In a 4-6 quart slow cooker, add the beans, tomato paste, vinegar, garlic, salt, mustard, maple syrup, brown sugar, and Worcestershire sauce. Stir. Stir together water and corn starch. Add to slow cooker and stir until combined. Cook on low for 8 hours -- serve warm, room temperature, or cold! Cook on low for 8 hours — serve warm, room temperature, or cold! Do you think this recipe would work for uncooked beans? Like the ones you buy in a bag. I’m looking for a recipe for a healthier version for these type of beans. THANKS! Hi Caroline! They might, but you’d likely have to soak them first and I’m not sure if they would require more liquid. I can’t say for sure because I haven’t tried. OK I have this weird phobia of recipes that contain ketchup. I don’t know why because I love ketchup on its own, but when I see it in an ingredient list I go running for the hills LOL! So basically I love that you left it out! These beans look seriously delicious! Yay for spending lots of time outside right now! Lol! I am a big ketchup lover! But when I’m going for “healthy”, I do try to stick with “one-ingredient-ingredients”! 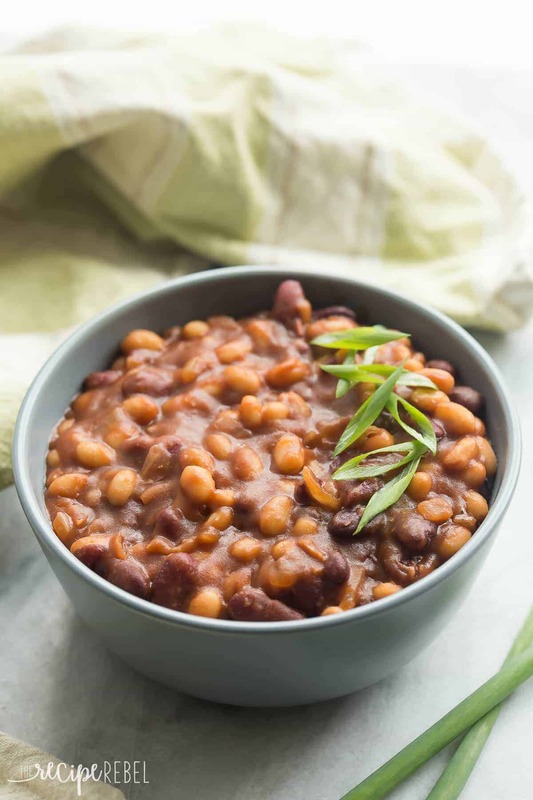 My husband and kiddos love baked beans and I love that you made them healthier and in the slow cooker! The maple and balsamic combo sound perfect with any grilled dishes! Are you sure these canned beans need 8 hours in the slow cooker? I checked them earlier, and I wasn’t quite happy with how the flavors had come together and how tender the beans were. If you like your beans firmer, you can definitely go with a shorter cooking time. 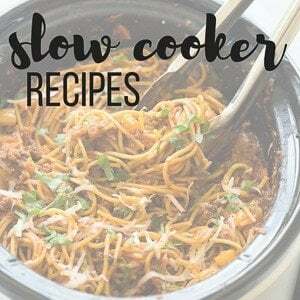 It will also depend on the slow cooker you use — they’re all so different! I’ll take a big bowl of these along side any summer meal, please! Easy is the best right now, and the fact that you don’t have to turn on your oven for these “baked” beans makes things infinitely better. Love these! You’re reminding me that it’s been basically FOREVER since I last made baked beans so I’m all over these! 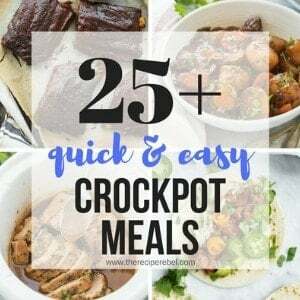 Totally loving that I can just dump everything in the crockpot and forget about it! Yes, EASE is totally a big part of our summer recipes these days! It’s allllll we can handle! Ashley, I’ve never made baked beans before either! and my kids love them! 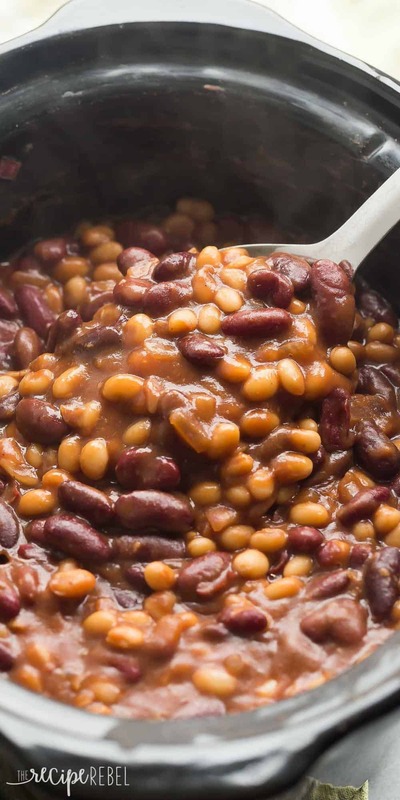 LOVE this Healthier Slow Cooker Baked Beans recipe!!!! Looks delicious! I like beans an embarrassing amount so this is totally up my alley! I can’t wait to try Ashley! I love maple and balsamic together, I bet these baked beans are amazing! I’ve never actually made my own either, although I like them well enough. And I never buy the canned ones either, so I think I might need to try making them soon! Perfect for BBQ season! Yes, definitely! It’s one of my favorite combinations too! These beans look fabulous Ashley! Love that you used balsamic vinegar! I don’t buy canned beans either, I just can’t. Ew, right? Leave it up to you to experiment with baked beans for the first time and knock it out of the dang park! These look faaaaaaab, chicka! LOVE the maple and balsamic combo! I would have never thought of those two ingredients with baked beans. 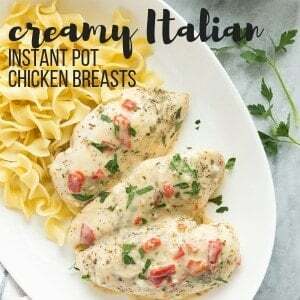 Plus you made these in the slow cooker FTW?! Heck yes! Boy constantly hassles me to make him baked beans, so I’m totally busting out this easy, delicious recipe next time! Cheers, Ashley! Doooo it! Thanks Chey! The husband loves beans too, so he was all over these! My oldest daughter is OBSESSED with baked beans and I think she would love these! I’ve never made baked beans myself either but this recipe is going to change that!! These look so delicious! I couldn’t believe I’d never made them before either! I hope you enjoy! I love baked beans and haven’t made them in so long — I have no idea why! These are inspiring me to get in the kitchen and make some — these look like the best side for BBQ! I love any and all baked beans! I’ve never tried a maple balsamic version, but they sound delicious. Love that these area made in the crockpot, it’s too darn hot here to turn on the oven! Exactly! It is miserably hot here and I don’t feel like cooking anything! Hi Ashley! I love all kinds of beans, but baked beans are my favorite! And (like potato salad) I’m always on the lookout for new recipes to try. I must admit though that I would add bacon! I actually eat cold baked bean sandwiches with yellow mustard…a throw back to childhood. Oooh I do love bacon Dorothy! I was trying to keep these a little on the lighter side, but I think bacon is a fantastic addition! I could eat baked beans and potato salad with grilled meat alllll summer long! We love it too! Maple balsamic baked beans sound wonderful, Ashley! I love that they are healthier. I definitely need to try this recipe; my husband loves baked beans. Thanks Jen! 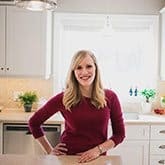 My husband does too and he’s a big fan of these! 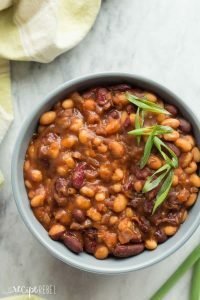 I’ve been wanting to try making baked beans in the slow cooker for a while now, and these look so good! I love that you kept these full of real ingredients. I can’t wait to try them! Thanks Kristine! I cheated and used canned beans, but it’s summer and I’m lazy! Lol. I’ve never made my own baked beans before, but I sure do love them! My mom makes a delicious homemade version, but I’ve never had a balsamic kind before. Sounds perfect for the summer, Ashley! Thanks Gayle! I am all about EASY these days!